Like many people I like to shop in bulk, which means that once so often I find myself lugging my toddler’s weight in rice home from Levinsky market. Sure, I could be buying rice around the corner from my house in the convenient air conditioning of Eden Teva Market — Israel’s version of Whole Foods — but it’s a matter of principle. I like Levinsky, I like supporting the small businesses that predate Eden Teva by several decades, I like buying from people who are passionate about their products, as opposed to somewhat apathetic checkout clerks. And if the displays at the market aren’t as artful as those at the grocery store — well, the prices at the market tend to be lower, too, even though the little stores there lack economy of scale. I have one store where I do much of my shopping for grains and nuts, so I went there with the intent of stocking up on rice. David, like many of his counterparts at Levinsky, is Persian, and his stand has lots of ingredients that cater to the Persian community, including saffron imported from Iran (I never asked how it get to Israel). Like the other shops, he has barrels full of nuts and dried fruit facing the street, but the interesting stuff is inside — barberries are stored in the freezer (keeps the color better, he explains), saffron is in tiny bags behind the cash register (at 15 shekels for half a gram, that’s understandable) and half a dozen varieties of basmati rice line the shelf along the narrow passageway into the shop. I pushed my way into the shop to examine the rice. There were four other customers there, all of us clamoring for David’s attention like impatient children. What’s the difference between the basmati rices? I asked. This one is 50 shekels for 5 kilos, that one’s 60, that one’s 80, that one’s 110, he started. So which one should I buy? I asked? Just get the 50, he said. I lugged a bag of Jasmine rice — known as Persian rice in Israel — and a bag of basmati. I’m getting both, I informed him. Now, David always asks me what I’m planning to make and shares little tips about whatever it is I’m buying. This time was no different. At home we mix them, he said. Two cups of Persian and one cup of basmati. The Persian rice is aromatic, and the basmati is beautiful, he explained. I thanked him and hauled the rice onto my bike. For the record, carrying a 10-kilo toddler is easier than carrying 10 kilos of rice. The toddler holds on. But I digress. Now, if you want advice on how to prepare rice, getting it from a guy who sells a dozen white rice varieties is not a bad way to go. And you can use that tip here, though I have to admit that it works better when just making plain, white rice — the mangold mixed into the rice adds its own texture, which takes away from the basmati. But no matter. This is a rice dish I’ve been making for the past few months, due to its clear advantages — it’s easy, it contains a large serving of leafy greens (namely, mangold), complete protein (rice plus chickpeas) and even better, my son eats it for meals. What’s not to love? This dish resembles the green rice you find in Persian restaurants and homes, but the flavor profile is totally different — Persian rice tends to contain a mix of fresh herbs, including dill. This version is much milder, and gets its green color from an entire bunch of chopped mangold (a.k.a. Swiss chard). 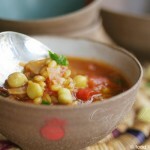 A cup of chickpeas rounds it out to make it into an easy, complete dish. The mangold and the onion are chopped in a food processor, so that the main texture in the final dish is the rice and chickpeas, not the greens. Cut the onion into large chunks and finely chop in a food processor. Put into a large pot on a medium flame, stirring occasionally as the onions release their juices and brown (no oil is necessary). Clean the mangold, chop into chunks and then put into the food processor with 1/4 cup water (by chopping first by hand, you prevent any long fibers from creating residual stringiness). You might need to blend the mangold in two batches, each with 1/4 cup water. Add the mangold pulp to the pot with the onion and let simmer. Rinse the rice, drain and add to the pot along with 2 1/2 cups water, the chickpeas, the salt, the pepper and the cumin. Cover, bring to a low boil and let simmer until the rice is cooked, about 15 minutes. Shut the flame and let the rice sit covered for another 10 minutes, then fluff with a fork before serving. 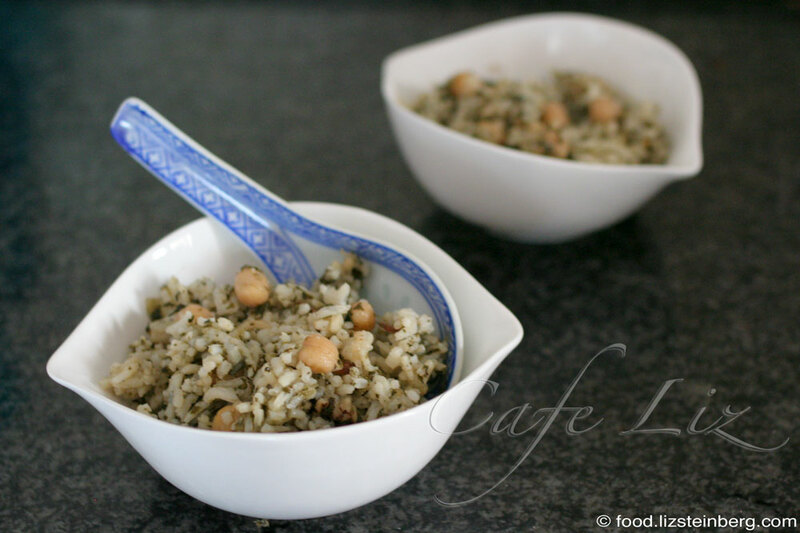 8 Responses to "Green rice with chickpeas"
Loved your article! I shop like you do (the bulk, not the bike!) but we don’t have a market like Levinsky. Thanks for the interesting information. I have been wondering what those packages of “Persian rice” are, since the Persians I know use Basmati. How surprising to cook Basmati and Jasmine rice together! Did you ever try it? I wonder what happens to their texture. I like making green rice and appreciate your easy recipe–easier than mine. I’ve often had Persian green rice with fava beans or lima beans in it. Using chickpeas is a good idea. 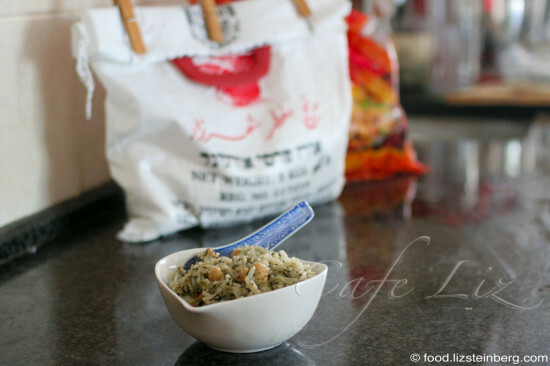 In the Persian markets, have you ever seen kashk, a dairy product in a jar? It’s usually labeled whey and has a very intense flavor. It’s drizzled over an eggplant dish and into vegetable soups. Here’s a picture with description. I certainly have learned a lot here! Thank you for that!! Living in Australia with its strong Asian fusion food culture I eat a lot of rice: admitedly mostly brown for health reasons. 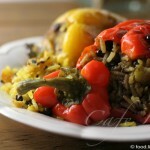 However I have never used a jasmine and basmati combo and would really like to see the difference. 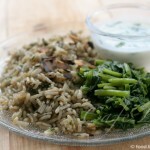 Have also not made ‘green rice’ this way: so that will be an interesting recipe to try! Oh loved to be along with you on your shopping trip also 🙂 ! Faye, I tried it, but at least when adding all sorts of greens as in this recipe, the rice came out a little too soft for the basmati really to have a prominent texture. I’ll try it again with plain white rice. I haven’t seen kashk but I bet the sellers at Levinsky know what it is (and it could be hiding in plain sight). Can this be made with brown rice? Is white rice even healthy? Sheila, you could try brown rice, I don’t see why it wouldn’t work. I personally don’t like brown rice so I haven’t tried. As to whether white rice is good for you — I guess that depends what you consider healthful food.